I'm a huge proponent of some killer sky-high heels. I blame my grandma. At 87 years old, she said she lived vicariously through my shoes because those orthopedic ones were a necessary evil. But back in the day, she could rock a pair of heels. 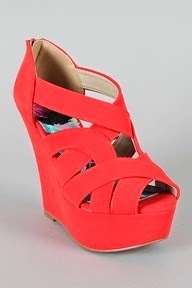 For days when I'm chasing around a little munchkin (aka every day), I love a good pair of wedges. They're easy to walk in, they stay on so well, (ankle straps!) and the sky is the limit on those platforms, which is always good news for short girls. Thank you, pinterest, for never failing to fuel my shopping addiction.